Chocolate owes its melt-in-the-mouth texture to cocoa butter, its own rich and palate-pleasing natural fat. Chocolate with lots of cocoa butter also tends to be thin and runny when it's melted, a useful characteristics when you're dipping or coating sweets in chocolate. If the chocolate you have on hand isn't thin enough, you can add cocoa butter, but it's expensive and hard to find. Coconut oil has similar characteristics and is available in most supermarkets, making it a convenient substitute. Choose small saucepan to use as the base of your double boiler, and a clear glass bowl for the upper half. The bowl should sit comfortably on top of the saucepan but not make contact with the water underneath. Bring the water in your saucepan to a gentle simmer, but not a boil. Pour your chocolate chips, grated chocolate or chocolate pieces into the bowl, and add approximately 1 tablespoon of coconut oil for every cup of chocolate pieces. Place the bowl over your pan of hot water. Warm the chocolate gently over the hot water, stirring frequently, until it has mostly melted. 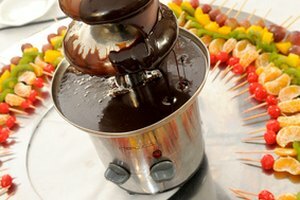 Remove the bowl from your double-boiler setup and continue stirring until the last few lumps of chocolate have melted. 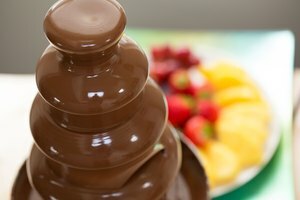 Test the chocolate's viscosity by dipping one of your sweets or pieces of fruit into it. If it adheres and makes a perfectly thin, even coat, you've got the right consistency. If it's too thin, add a few more pieces of chocolate to thicken it. If it's still thicker than you'd like, add another teaspoon of coconut oil and stir it in until it melts. Return the bowl to your double boiler, if necessary. 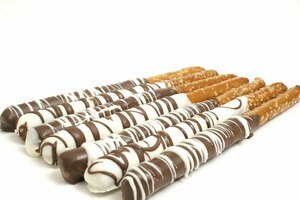 Dip your remaining treats once you're satisfied with the chocolate's consistency. Place your chocolate in a large, microwaveable bowl. Add 1 tablespoon of coconut oil for each cup of chocolate pieces. 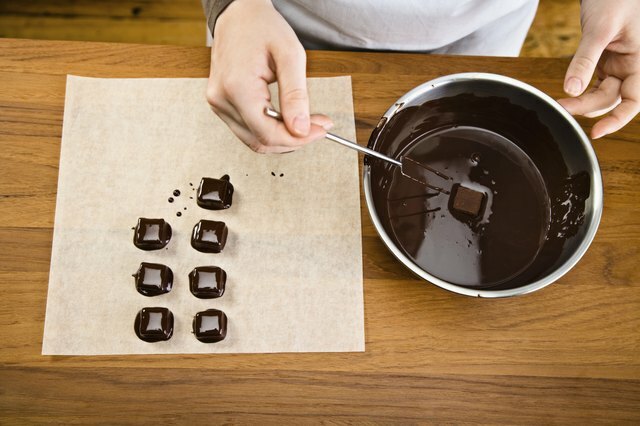 Microwave the bowl of chocolate pieces at 50 percent power for 30 seconds, then remove it and stir. Most of the pieces will only just be starting to warm at that point, but stirring is still important because the pieces heat unevenly in the microwave. Return the chocolate to the microwave and continue heating it at half-power, in 20- to 30-second increments. Stir it each time, until the chocolate is approximately two-thirds melted. Then leave it out and stir continuously until the chocolate has completely melted. Dip a small piece of fruit or other "tester" into the chocolate, to assess its consistency. If it's too thick, add another teaspoon of coconut oil and stir it in until it melts. If it's too thin, add a bit more chocolate. You might need to return the bowl to your microwave for a few seconds, to ensure it all melts evenly. Refined coconut oil is flavorless and suitable for general use. Virgin or unrefined coconut oil has a mild but distinct flavor of coconut, so only use it if that's appropriate in your finished product. 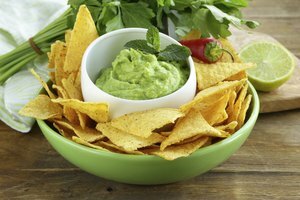 Coconut oil has a lower melting temperature than cocoa butter, so the finished treats will have a slightly softer coating than usual. Depending how much cocoa butter you use, it might be necessary to keep them refrigerated until just before serving time. Chocolate thinned with approximately twice as much coconut oil makes a thin shell for dipping or pouring over ice cream, where it will freeze and harden on contact.